Heather and I often are of the same mind. Sometimes one of us has to catch up to the other, but generally speaking we tend to land on the same conclusions within a similar timeframe. For instance, I discouraged her from getting rid of the hedgehog paraphernalia after Junior died until a little time had passed. I had this sense that she would grieve for awhile, then get the itch to get another one. I was right. She'll be coming home from southern Alberta next week with a yet-to-be-named infant hedgehog. She was the one who suggested that it might be time to let go of our attachment to the portrait of Mother Teresa that has been hanging over the fireplace for months, the only painting of over 150 done in the past year that we felt compelled to keep. Seeing a couple of posts yesterday morning about it being the two year anniversary of the passing of Barb Jewers gave me an idea. 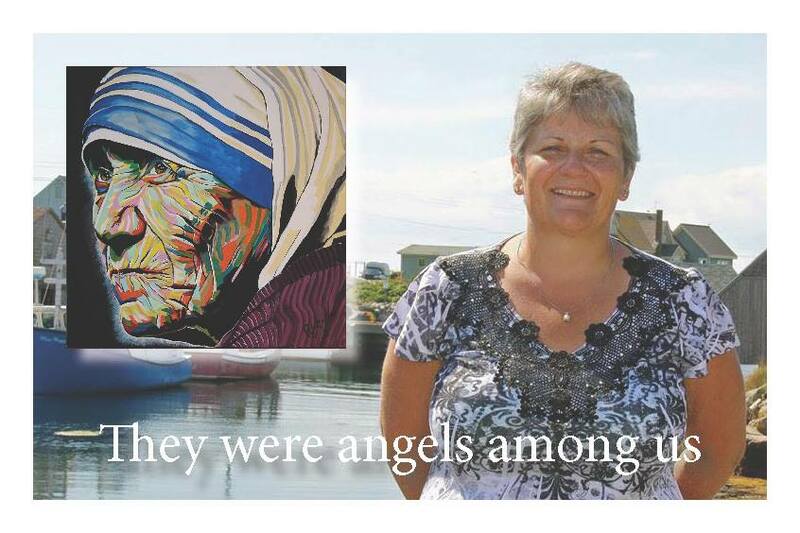 Perhaps I could put up the painting of Mother Teresa up for auction to raise some money for the United Way campaign in her memory. They were both angels who walked among us; they both cared deeply for people and people cared deeply for them. It felt like a perfect fit. Sherry offered a generous bid of $250 to get the ball rolling followed quickly by a $275 bid from Juanita. Then something completely unexpected happened. Colin Hartigan of Coldwell Banker, also a member of the United Way board of director, bid $600 with the hope that the painting could live in the Barb Jewers Reflection Room and Resource Library at The Redpoll Centre. Marty Giles began by upping the bid to $700 then came up with the brilliant idea of matching Colin's bid instead and adding to it as a team effort. Other board members - Don Scott, John Evans and Andy Carter - jumped on board following by United Way staffer Cindy Walker and John Rhind, former boss of Shell Albian Sands. The bidding closed at midnight at $2,700 because a couple of caring souls started a movement, thought beyond themselves, created something bigger and invited others to join in.